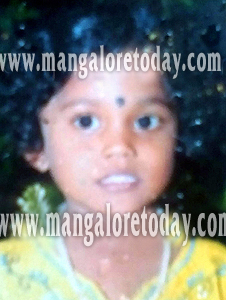 Kundapur, July 10, 2015 : A seven year old girl who was on way to school along with her mother, reportedly met a watery grave in the river while crossing a wooden bridge at Marakatte in Kollur police station limits on July 10, Friday. The deceased girl is Vismaya Devadiga, daughter of Jalaja and Shekhar Devadiga of Sanyasibettu, Marakatte. She was a third standard student at the Marakatte Government School. . The overflowing river due to heavy rains is said to have resulted in the tragedy. In fact the narrow bridge was laid by the villagers themselves after their repeated pleas to the authorities to construct a bridge fell on deaf ears. It is learnt, Vismaya’s mother had held her hand tight while walking on the bridge along with another child. However, Vismaya insisted that she can walk alone and just stepped ahead when she suddenly slipped and drowned. Search is on for the body of the girl by the fire service personnel and locals. Local MLA Gopal Poojary also visited the place.